American Muslim Voice Foundation’s first Annual Eid Picnic was held on October 18th, 2008 at Cardoza Park in Milpitas, California. 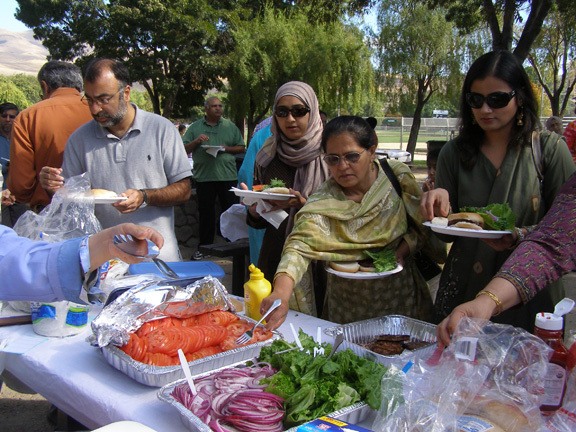 The Eid picnic attracted a large crowd of over 250 people from all walks of life. The secret of the successful picnic was team work, great food and fun filled activities for the whole family. It also reflected the personal efforts of AMV’s Northern CA president Syed Zafar Mohsin and Mrs Zia Mohsin’s grass-roots work in the community. 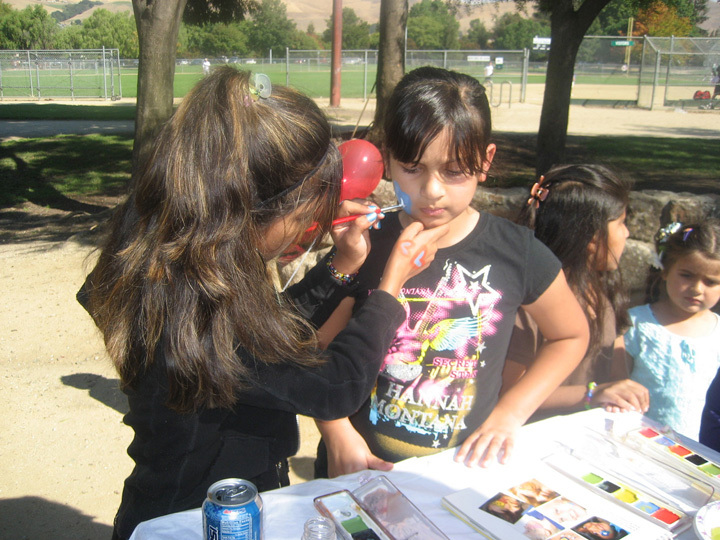 The AMV Foundation picnic was held to spread the miracle movement of friendship. AMV’s approach to community-building is a simple one. The organization has been hosting annual open houses, peace picnics and peace conventions to unite neighbors and strangers alike with the fulfilled promise of food and social engagement. Successful events like these separate the AMV from the scores of organizations that do not take the extra steps beyond interfaith dialogue. These events illustrate AMV Foundation’s vision of peace through sowing the seeds of friendship. Welcoming the old and new friends Samina Faheem Sundas, Founding Executive Director of The AMV Foundation explained why social events like these are crucial for the future of our nation. AMV Foundation is striving to create a culture of peace, acceptance, mutual respect and harmony by fostering friendships among all Americans. The safety, security and happiness of our next generations depends on that. We must dedicate ourselves to build a beloved, inclusive and harmonious global village, where all of us could raise our children together. We can help build a world where all of us feel safe and at home. It was a beautiful October afternoon, the sun was shining, blessing u s with its warm rays, there were lots of engaging conversations and most notably the children’s laughter was infectious. The scent of the spicy ethnic snacks and halal hamburgers with all its condiments were appealing. The application of henna painting, kids’ face painting and colorful balloons added to the atmosphere of Eid. Everyone had a great time and it was a sight to be seen. Pete McHugh, Supervisor SCC Dist 3, appreciated the AMV Foundation’s efforts of building bridges. He said that the AMV Foundation is distinguished among all groups because of their peaceful community building. McHugh particularly applauded Samina Faheem Sundas, the founding Executive Director of the AMV for her dedicated hard work. A number of local officials graced the event. Among the local dignitaries were Jose Esteves (Mayor Milpitas), Bob Livengood (Vice Mayor Milpitas), Dave Cortese (Vice Mayor San Jose), Pete McHugh (Supervisor SCC Dist 3), Ms. Debbie Giordano (Milpitas Council Member), Carmen Montano (Milpitas School Board Member) and City Commissioners. 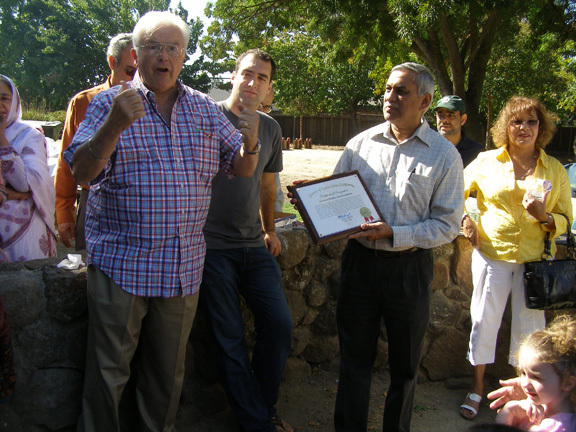 Pete McHugh presented a proclamation to AMV for holding Eid picnic and bringing fellow Americans to a common platform. “On behalf of the residents of Santa Clara County, I am honored to recognize the AMV for promoting non-violence, inclusiveness, and civil, immigrant and human rights with the goal of creating a culture of peace, acceptance, mutual respect and harmony,” said the proclamation. Zafar Mohsin, the AMV Foundation President for Northern California explained the significance of Eid which is celebrated at the end of Ramadan. He thanked everyone for attending the picnic. He especially thanked the public Officials for attending AMV Foundation’s first Eid picnic. “We are encouraged by the supportive comments from our guests.” He also thanked the Board Members, Abdus Sattar Ghazali, Firdous Kamran, Keith Evans, Asiya Iqbal, Zeya Mohsin and volunteers for working hard to make this picnic a great success.